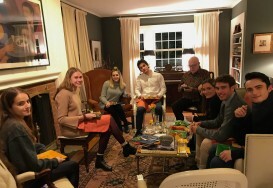 The week before Thanksgiving my husband and I hosted our annual dinner for his freshman class at Amherst College. This year along with worrying about getting food cooked for fifteen, I was also concerned about the weather. Forecasters were predicting a hearty snowfall for the night of our party. Since we live two miles from campus, we were keeping our fingers crossed that the storm would start later than expected. Luck went our way with the students arriving around 6, and no snow in sight. For appetizers I had set out a wheel of Camembert, halved and stuffed with chopped Medjool dates, dried apricots, and toasted walnuts, all scented with orange zest. Toasted baguettes slices and apple wedges made fine canvases for the stuffed cheese. 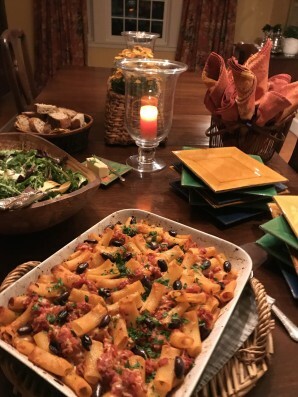 A big dish of rigatoni baked with a spicy tomato sauce, a salad of mixed greens and shaved fennel tossed with lemon and olive oil, and a basket of warm artisan breads followed. Still, no snow. 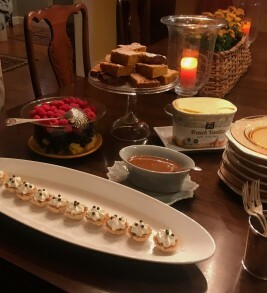 But when the desserts–pumpkin brownies served with vanilla ice cream and caramel sauce, petit chocolate tarts, and fresh berries with diced pineapple—were arranged on the table, the snow at last appeared. After sampling the sweet treats, the students hurried outdoors. 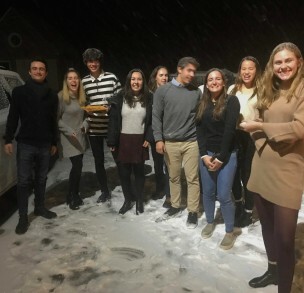 It turns out that five of our guests were from California, and had never experienced fluffy flakes falling on their faces! It was quite a sight! The creamy Camembert filled with the fruit and nut mélange, made a tempting opener to enjoy on this cold blustery night. It was ideal for a crowd, took less than 30 minutes to assemble, and was prepared two days in advance. It would make a fine appetizer to offer for holiday parties in the weeks ahead, snow or no snow! 1. In a medium bowl, toss the dates and apricots with the orange juice. Let stand 10 minutes. 2. Place the butter in another medium bowl; mash with a fork until it is very soft and malleable. Add the date/ apricot mixture and the orange zest, and mix well with the butter. Add the walnuts and mix again. 3. Set the Camembert on a chopping board. With a large, sharp knife held parallel to the work surface, carefully halve the cheese horizontally so that you have two equal rounds. 5. Bring cheese to room temperature 45 to 60 minutes before serving. Garnish top of cheese with 3 remaining walnut halves and, if desired, with some sage leaves. Transfer to a serving plate or tray and arrange baguette slices and apple or pear slices around the cheese. To serve cut a small wedge of the stuffed Camembert and spread on baguette slices or apple or pear wedges. Serves 8. Cooking Tip: To toast walnuts spread on a rimmed baking sheet and place in a preheated 350° F oven until lightly browned, 6 to 8 minutes. Watch carefully so nuts do not burn. Remove and cool. Chop coarsely. 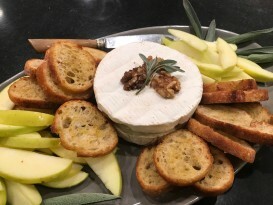 This entry was posted in Food News and tagged appetizer, apricots, Camembert, dates, walnuts by brosbottom. Bookmark the permalink. This sounds easy and delicious. I will include it in my food stach to take with us to the mountains to enjoy Christmas eve. Happy Holidays and thank you for your posts. 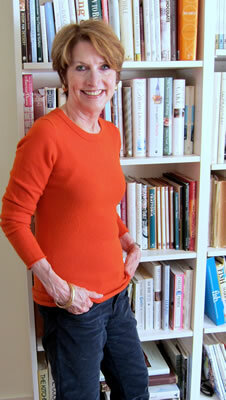 My friends and I have been enjoying your recipes. I’ve never done a cheese round like this. Sounds easy and knowing you, it will taste wonderful. Love all of your recipes. Betty, you were way ahead of your time – even way back when. Happy holidays. Your “spread” sounded so delicious….I wonder if the students elect to take a course from your sainted husband just so they can enjoy your hospitality and your delicious dinner? I don’t think so, but we always enjoy having his students come to our home.